If you have any questions or would like more information about staging your home please Contact Us. Selling your home isn’t the easiest thing to do, but with a little bit of work and re-organization, it can become a smoother process. One of the most successful ways to sell your home – which will also make it sell quicker – is through the art of staging. According to a study done by the Real Estate Staging Association, homes that were staged stayed on the market 78% less of the time of homes not staged. But you don’t have to be an interior designer or have lots of disposable cash to quickly re-design and tidy up your home; it’s easier than you think. There are many reasons to stage your home. 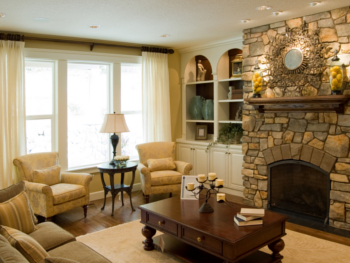 Of course, the main focus of staging is to sell your home quicker by making it more attractive. But with that, you could also sell it at a higher price and generate more showings to your home. With staging, your home will also be effectively advertised online because you’ll have better photos that capture the appealing features of the house. Breaking from your home can be emotionally distressing; you’ve spend so much time there, and it may cause a few tears to completely change things around. But you’re going to have to emotionally separate yourself from your home and start thinking of it as a product. A product you’re trying to sell. Take a good look around your home and pretend that you’re a potential homebuyer. Take a note pad and write down all the things that you find unappealing about your home – whether that be paint color, cleanliness, tidiness, furniture or damage. These are the things you should focus on. It wouldn’t be a bad idea to ask a family member or friend what they think of your home, and listen to the opinion of your real estate representative – they have experience in this field. Don’t be defensive to their feedback; they are just trying to help you sell your home. Major cleaning will have to be done to your home, even if you think it’s reasonably tidy. Every desk, countertop and end table will have to be cleared except for small decorative items such as vases. In particular, be sure that your kitchen, arguably one of the most important rooms in a home, looks immaculate. Clutter will just do more harm, so make sure things are tidy and any unnecessary items are put away. If you have pets, make sure any odour or lingering scent of them are removed. It wouldn’t be a bad idea to board your pet(s) or have a friend or family member take care of them for a day. De-personalize yourself from your home and remove personal items, including extra photos and religious items, so the homebuyer doesn’t feel like they are just viewing some stranger’s home. As well, you may have more furniture than you think. Open up space in bedrooms, living rooms and even the garage. This way, potential homebuyers can visualize their things in those spaces – exactly what you want them to picture. Making space in the kitchen, living room, bed room, bathroom and laundry room are priority. Not only do you have to worry about the inside, but take a long and slow walk around the exterior of your house and clean up on the outside. You may even have to plant some flowers and do landscaping to make the exterior look better. If some of your flooring, lighting and wall colors are out-dated and dull, you may want to consider using a few bucks to refresh the look of your house. If the color of your walls are bit too bold or if you still have wallpaper, repainting them a neutral color such as grays, light blues or beige's may increase appeal. Any damage to your house, no matter how small it is, will be noticeable to the viewer. It is probably a good idea to repair all damages in your home because you don’t want to deter any potential buyers during an open house. Refreshing the look of your home will only increase the chance of a sale. You may have to put in bit of money to do this, depending on the amount of damage to your house, but overall, it is relatively inexpensive and easy to do. Instead of sleeping in on a Sunday afternoon, get up early and start staging your home – it’ll only do you good.